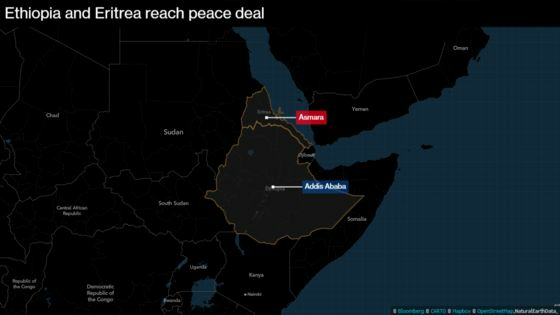 (Bloomberg) -- Ethiopia and Eritrea made a declaration of peace and agreed to reestablish economic links after an unprecedented summit between the Horn of Africa nations’ leaders ended decades of enmity. In an historic visit to neighboring Eritrea, Prime Minister Abiy Ahmed sealed a swathe of agreements with President Isaias Afwerki, restoring diplomatic relations, flights and telecommunications, as well as securing Ethiopia’s use of Red Sea ports. Foreign observers described it as a boost for regional stability, and there were signs that United Nations sanctions, imposed on Eritrea in 2009, may be lifted. The rapprochement was another sign of sweeping change in Ethiopia since Abiy, 42, took office in April. Facing unrest, protests and displacement of people that have threatened to derail a boom in Africa’s fastest growing economy, Abiy and his ruling party lifted a state of emergency and accelerated long-awaited market reforms. With his trip to Asmara, Abiy has begun to close a bloody chapter in his nation’s history: a 1998-2000 border war that claimed as many as 100,000 lives and left thousands of Ethiopian and Eritrean families divided. The two sides have clashed sporadically in the years since and accused each other of supporting rival rebel groups. Isaias at a state dinner congratulated Abiy on “the bold political choice he has taken that will recoup lost time and opportunity in the past 20 years,” Eritrean Information Minister Yemane Gebremeskel said on Twitter. Abiy’s administration has also announced plans to open up state monopolies including sugar, airlines, and telecommunications to foreign investors. The ruling coalition has begun to allow opposition political groups and thousands of detainees have been released. Eritrea, which sits on a key shipping strait linking the Red Sea and Suez Canal and seceded from Ethiopia in 1993 after years of conflict, is a one-party state where adults must undertake 18 months of government service. Rights groups say the period is extended indefinitely for many, fueling a wave of migration. As recently as 2015, Eritreans were the fourth-biggest group risking their lives to cross the Mediterranean, after Syrians, Afghans and Iraqis, according to the UN. Eritrea’s government has said national service is necessary to defend itself from Ethiopia and calls those fleeing overseas economic migrants, not refugees. UN sanctions were imposed almost a decade ago on Eritrea after allegations the country backed al-Qaeda-linked militants in Somalia. Eritrean authorities have repeatedly denied the claims. UN Secretary-General Antonio Guterres, visiting Ethiopia for discussions with Abiy, said Monday that sanctions may no longer be needed after the “remarkable” talks. “The sanctions were motivated by a number of events that took place,” he told reporters in the capital, Addis Ababa. “It is my belief that if those events, if the reasons will no longer exist, they will have become obsolete.” A UN decision on whether to review the sanctions is due Nov. 15. Abiy’s chief of staff, Fitsum Arega, said Monday on Twitter that Ethiopia had submitted a request to Guterres for the UN to lift the sanctions. Ethiopian Airlines Enterprise will restart flights to Asmara next week, the ruling party-funded Fana Broadcasting Corp. said. The state-owned Ethiopian Press Agency said the national carrier would take a 20 percent stake in Eritrean Airlines, citing Eritrean press. Until now, Ethiopia has been forced to rely on Djibouti and Sudan for access to the sea. 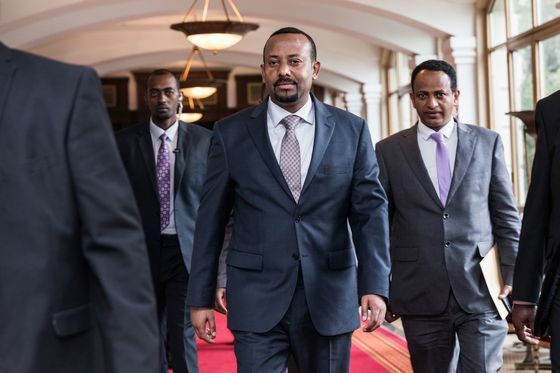 But since Abiy came to office, the authorities in Addis Ababa have moved quickly to improve the nation’s transportation links to the outside world, including agreeing to develop a port in Sudan, and swap shares in state-owned ports, airlines, and telecommunications with Djibouti.